Ubisoft today announced it’d be giving away Assassin’s Creed Unity away for free, as a tribute to the damaged Notre-Dame and to give gamers “the chance to experience the majesty and beauty of the cathedral” in the wake of the fire. Unity, which is set during the French Revolution and stars a rebellious aristocrat-turned-Assassin named Arno, features a painstaking replica of Notre-Dame — a recreation so thorough that it could be a valuable resource to the French government when reconstruction gets underway. The artist in charge of the design spent two years working on just the cathedral, in order to ensure it felt like the real thing. A spokesperson has told Kotaku it’s not a precise duplicate of the real thing: “While we wanted to be very precise with details, there are some differences in terms of scale and with some elements.” But it’s still pretty damned close. 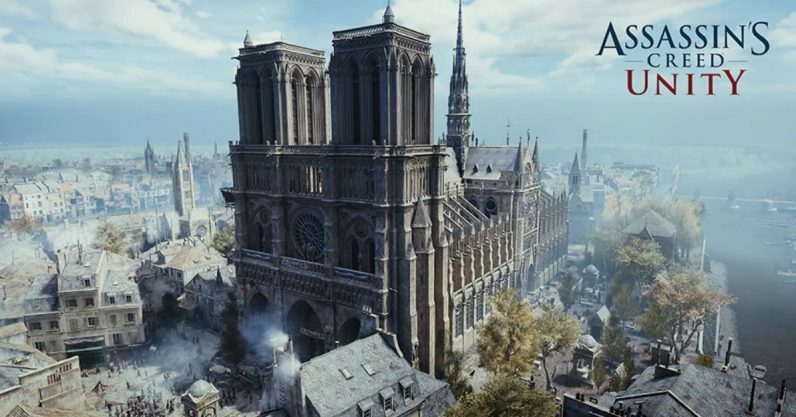 The company stated they’d spent a large amount of time in Paris during the development of the game, in particular Notre-Dame, which is painstakingly recreated within the game. “We hope, with this small gesture, we can provide everyone an opportunity to appreciate our virtual homage to this monumental piece of architecture.” It’s a pity the game doesn’t have the Discovery Tour exploration mode available in later Assassin’s Creed games, but gamers can still climb around every inch of the interior and exterior with Arno. This is not how I saw the company resurfacing Unity — if indeed it ever did so, considering the game was overall a bit of a disappointment. As tragic as the circumstances are, it’s gratifying to see this otherwise-unexceptional entry in the series could provide a view into Notre-Dame, that, sadly, most people will no longer be able to have. Even with a dedicated rebuilding effort, it’ll still be years before anyone can even step foot inside the cathedral again, let alone experience it in all its glory. So being able to explore it within the game — and for free, at that — is about as close as anyone will be able to get for a long time. Ubisoft will also be donating €500,000 (over $500,000) to the reconstruction fund and is encouraging those who download the game to do that same. You can download Unity from Uplay here. The giveaway ends on April 25th.